Art In The Open. The Night. After what can only be described as a terrible summer, and with the threat of a hurricane bearing down on us, the weather gods smiled, and gave us the best day of summer. It was warm and sunny all day, and as night came it was a perfect evening to be out and enjoying art. We went down to Victoria Park and the sight was breathtaking. A field of bonfires, a tree of television monitors, projections, sound installations, a bunch of great sculpture, And a giant birds nest. What more can you ask for? Art In The Open In Which a Parade of Crows Descends. One of the highlights of Art In The Open was the parade of crows. Which was a beautiful moment when the Charlottetown crows returned to Victoria Park. Jane and I were participants in Art In The Open, and though we were very busy at our project, I slipped away to see some of the other artists work. Here are a few random images from the goings on in Charlottetown yesterday. A rascally heap of sand & scum & swamp that only produces potatoes! Anyone is his own unique world! It’s good not to be connected to the mainland. It’s good to have our own lane. I haven’t done a lot of what you would call performance art, but my wife Jane Ledwell and I are putting together an interactive art piece for an evening and night-time art festival in our town on August 27. The event is called Art in the Open, and our piece is called The Rumour Mill. We hope people will be curious enough to take part. I have put up a new page with the news release about the event, and I will post news about how the project all goes here on the blog. What art, or what good, can come from the PEI rumour mill, the transformative process by which information passes from ear to ear on PEI, being distorted or destroyed along the line? Through the everyday rumour mill, intentions and original messages become more fictive: through the art piece The Rumour Mill, tourism messages will become accidental poetry. Jane Ledwell and Stephen B. MacInnis propose a collaboration for Art in the Open to create a gossip-powered human machine for generating poetry. This interactive, interdisciplinary art project will visually incorporate elements of an old-fashioned wooden machine, including a hopper, harnesses, and a hand-cranked reel. Source material for phrases and images that will run through this machine will come from historical and contemporary PEI tourism promotions. Thematically, the artwork will play with notions about the culturally claustrophobic role of word-of-mouth on a small island, the oral and the aural in poetry writing and performance, and the relationship of tourism and culture in representations of Prince Edward Island. For each performance of the Rumour Mill, the artists will harness volunteer participants in a line in rope harnesses. At one end, a participant will pull a phrase or an image at random from a “hopper” pre-filled with phrases and generic images selected (by the artists) from Prince Edward Island historical and contemporary tourism promotions. The participant will whisper the phrase or a brief description of the image in the ear of the next participant down the line (as in the game of “Telephone”). As the phrase passes from person to person, it will be transformed by mishearings, misunderstandings, misrememberings – and by machinations of time, environment, and random events – to become a line of “poetry.” The artists will transcribe what the last person in the line says she or he hears on a scrolling sheet of brown paper, a roll of which will be spooled on a reel with a handcrank, so fresh paper can be exposed in time for the next line of poetry the human machine generates. The structure that houses the roll of paper will be built roughly with weathered, recycled materials to recall machinery in mills that were once common across PEI. The Rumour Mill will operate at scheduled times every 60 minutes from 4:00 p.m. until midnight, although it can also operate any time there are six or more volunteers. At least two additional performance times will be reserved for the Rumour Mill to generate lines of poetry in French. Between performances, viewers will be able to read lines of poetry that have previously been generated. Each performance will add at least three lines to the poem. 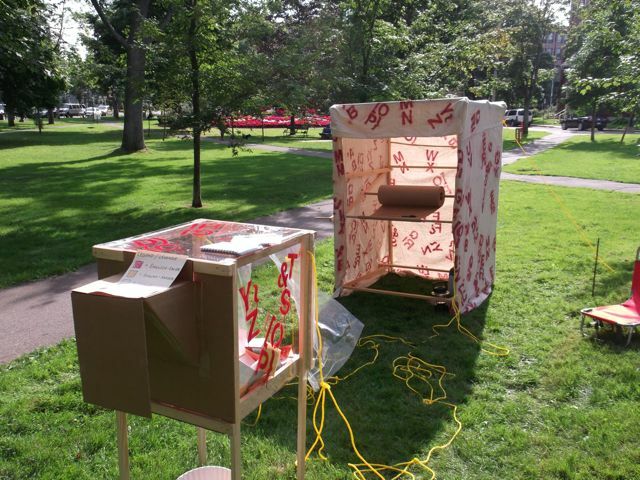 Due to the need for relative quiet, our preferred installation location is Rochford Square. 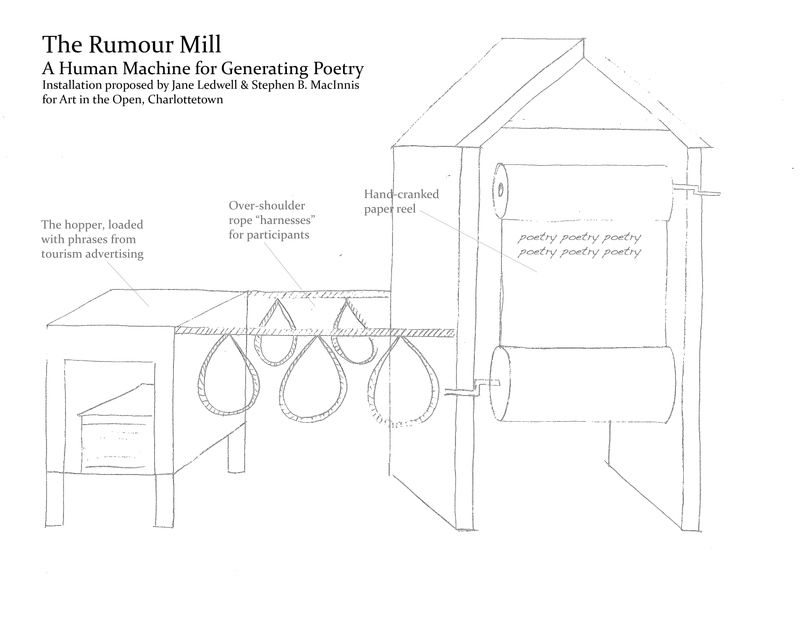 Following Art in the Open, the poems and documentation generated by the Rumour Mill will be published on Stephen B. MacInnis’s blog at https://sbmacinnis.wordpress.com.